Data recovery professionals often charge exorbitant amounts of money to recover files that have been lost due to hard drive failure, corruption, or accidental deletion. These services are essential, but for those who know about the alternatives, it's not necessary to shell out tons of money. Recuva is a software-based data recovery solution that allows normal computer users to easily retrieve data and files that might otherwise be gone forever. When files are deleted on a Windows system, the disk space that was used to store the files is simply flagged as being available for writing by the disk. Until the hard-disk actually writes new data over this old data, this means that the data is still there; it simply can't be accessed by normal means. Recuva is able to inspect the so-called "free-space" on your hard-disk drive and find deleted files. 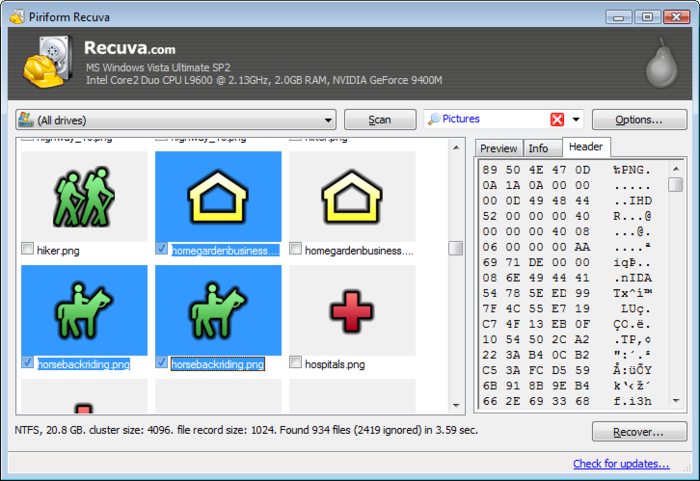 Recuva's user interface is very sleek, intuitive, and easy-to-use. On startup, the software automatically scans the free disk space and presents a list of files and data that can be recovered. It also includes a wizard that walks the user through the process of recovering lost files. It can even see the directory and folder information for these previously deleted files, so you can navigate by folder to find the files based on where they used to be located. Recuva is a smart and easy solution for everyday users who need to recover deleted data on their PCs. You don't have to be a computer expert to use this expert tool, either; Recuva is so user-friendly that you don't even need a help-file, although there is extensive on-line support for users at the company website. The best thing about Recuva is the low price. Now you can forget about paying a professional tons of money for your data.